At Saison, chef Joshua Skenes uses simple cooking techniques to maximize each ingredient's flavor. While the cooking techniques are simple, the process is not: meats are aged for several months, fish bones are roasted over embers and turned into a broth subtly brushed over cuts of sashimi, lemons are preserved for hundreds of days to counter their acidity. With a casual glance of a dish, one may never notice the labor involved; but when tasted, every course reveals a depth only possible by an involved cooking process. My recent meal was one of the most memorable, and delicious, meals I have ever tasted. Chef Skenes is obsessed with flavor and how best to enhance it. In contrast to restaurants that over-embellish dishes and add complexity at the expense of flavor, Skenes takes away. Flavor is paramount for chef Skenes; everything else comes secondary. There is a firm Japanese influence in his cooking rooted in its simplicity, from his cuts of sashimi and live prawns to his use of sea vegetables. Skenes builds on this base of Japanese ingredients and applies fire, culminating in a magical and unique cooking style. At the center of Saison is its hearth, an open wood-burning oven which nearly every dish utilizes in one form or another. Roasting over the hearth deeply intensifies the flavor of the ingredients. Sometimes Chef Skenes uses the hearth to roast an entire fish or meat, other times he'll roast the bones as a component for a stock used to make a sauce to accompany a meat. Whether intense or subtle, the subtle smokiness and depth from the wood-burning hearth seems to make its way into every dish. The result is an addictive, rustic, wholesome flavor that makes every bite interesting. The restaurant itself is set back in a barn-like industrial space off a quiet street in San Francisco's Mission district. It was only after hearing the clanking of pots and pans that I realized I was in the right place. While the restaurant is soon to change locations, the current warehouse-like space is beautiful. The warm glow from the embers of the hearth permeates through one of the two dining rooms. The space is pastoral and romantic, its unassuming decor exemplifies the simplicity of the food Saison serves. Reserve caviar - Wild reserve caviar from white sturgeon lightly smoked over the embers of the hearth. The smoking is just for a few seconds to firm the texture and add a smokey depth to the flavor. Alongside the caviar was a Sardinian "music paper," a thin cracker cooked in the hearth topped with a layer of smoked crème fraîche, artichoke citronne, artichoke purée, shad roe, egg yolks and whites, ficoide glaciale (ice plant), salt wort from Saison's farm, and wild foraged herbs. This herbal garden was dusted with gold leaf. Trio of canapés - Three plates of bite sized snacks. The first was a Marin miyagi oyster filled with diced cucumber, borage, and drizzled with olive oil and a dash of fermented lime. Its flavor was bright, briny, and clean. Second was a glass of tubers: giant carrot purée with parsnip milk and a purée made from crisp and roasted parsnip. Underneath was a creamy layer of salted egg yolk, oxalis tuber and leaves. The dish was garnished with mallow flower and crispy ice plant. Third, a sandwich of sliced radish topped with radish gelée. Inside was bitter melon glazed with roasted pig butter and nasturtium honey. The delicate balance of sweet and bitter is what made this dish, and prevented the sweetness of the honey from becoming cloying. Flight of fish - A selection of seven colorful fish, some aged and some straight from the sea. From left to right: Red sea bream (aged 3 days), lobster tail wrapped in white radish, pen shell clam, horse mackerel, Kindai bluefin tuna belly, striped jack (aged 5 days), and amber jack (aged 7 days). With the exception of the Kindai bluefin tuna, all of the fish were wild and caught with a rod, line, and reel. This was a seemingly simple dish; it was only after speaking with Chef Skenes that I understood the great amount of detail that went into each piece of sashimi to deepen the flavor. Each fish was brushed with a white soy sauce infused with the bones from that fish, lightly roasted over the embers of the hearth. Chef Skenes calls this "bone sauce." While the subtle addition of "bone sauce" is imperceptible by looking, I couldn't help but notice a meaty depth to the fish; an umami quality that enhanced each fish's flavor. The flight of fish was served with a rice crackling dusted with river vegetable, shrimp floss, and perilla salt. To the side was a small bowl splashed with a "bone vinaigrette," a vinaigrette of wild seaweed, dried fish, and citrus infused with the roasted bones of the above fish. This was an absolutely brilliant course, both conceptually and in terms of flavor. It was essentially a tour of the textures and flavors of the sea, each fish enhanced with aging and the smokey embers of the hearth. Brassicas - Various wild strands of the mustard family (ruby streaks mustard, malabar spinach, arrowhead and oxheart cabbage) each either poached or gently roasted over the embers of the hearth until crispy. Toasted grains add texture to the dish, including barley, emmer wheat, wild rice, and sonora wheatberry. The broth, poured tableside, was made from wild seaweed and an assortiment of dried fish including flying fish, sardine, and bonito. Drizzled throughout the dish were puffed grains to add textural contrast. Crowning the dish was a small quail egg. Vegetable aspic - A transparent bowl of fava beans, peas, zucchini and squash roasted over the fire of the hearth. Burried within was a crispy chip of eggplant skin and a generous wedge of buttery avocado. All of the vegetables were bound with a gelée of tomato consommé. The vegetables and their consommé sat atop a corn pudding glazed in olive oil with pimenton de la vera and basil seeds soaked in basil water. This dish was a balance of textures and temperatures all held together by the subtle smoke and meaty quality of the tomato consommé. The vegetable aspec was served with a salt made from prawn roe. The salt had the concentrated taste of shellfish, which also tasted really, really good on bread with butter. Crustaceans - A dungeness crab ragôut gently warmed in crustacean butter, served with santa barbara sea urchin and wild nasturtium leaf which had been gently roasted over the fire of the hearth until a crisp. Our waiter added a cool meyer lemon whipped cream, and later poured in a crustacean bouillon table side, made from lobster, crabs, and spot prawns. This was unbelievable. To the right was a live spot prawn just pulled from the tank and gently poached in its own sea water. The prawn was sweet and exceptionally fresh. I could have easily eaten a hundred of them. Pasternack's rabbit - Rabbit meat ground with foie gras and rolled into collard greens. This was gently poached in rabbit bouillon. Also in the bowl were kidney and liver roasted over the embers with herbs. Most of the herbs, leaves, flowers, and tips were wild and foraged, everything else came from White Crane Springs community ranch. Our waiter poured in a reduction made from rabbit bones slowly roasted over the embers of the hearth. This was a gamey, buttery chunk of meat that was enhanced by the vegetables and the subtle depth from the hearth. Heartbreads - Medallions of heart breads from Four Story Hill farm. These are slowly roasted over the embers with berbere spices, brown butter, and fir honey. This was a magical combination of oozy, buttery, and rich veal hypothalamus coated in sweet and crispy honey. Again, the subtle hint of smoke from the hearth really added an element of depth to this dish. Nuvola di percora - Warm nuvola di pecora piped into a freshly baked brioche with honeycomb. This was one of the most memorable desserts I have ever tasted. Salty and velvety nuvola di pecora oozing out of a light and fluffy butter brioche coated in a layer of thin, crispy honey. When sliced in half, the sticky honeycomb cracked in two and the warm cheese poured out of the center. This was a dynamic dish that tasted great when placed on the table piping hot, and as it cooled and the cheese began to firm. Preserved lemon A mixture of meyer lemon cream, lemon sorbet, and candied lemon from meyer lemon preserved on Jan 27, 2011. This was a mix of temperatures and textures all held together by the brightness of the lemon. The preservation process tempered the acidity making the lemon taste sweet with a hint of bitterness, rather than overly sour. Melon - Melon with sparkling vanilla sorbet, and shiso cake. Popcorn ice cream - A cool and creamy sphere of buttery popcorn ice cream, nicely balanced with a dash of salt. Candied raspberries - The natural flavor of raspberry enhanced with a thin layer of sugar. The sugar crystals also added a textural contrast to the soft raspberry. These were addictive. 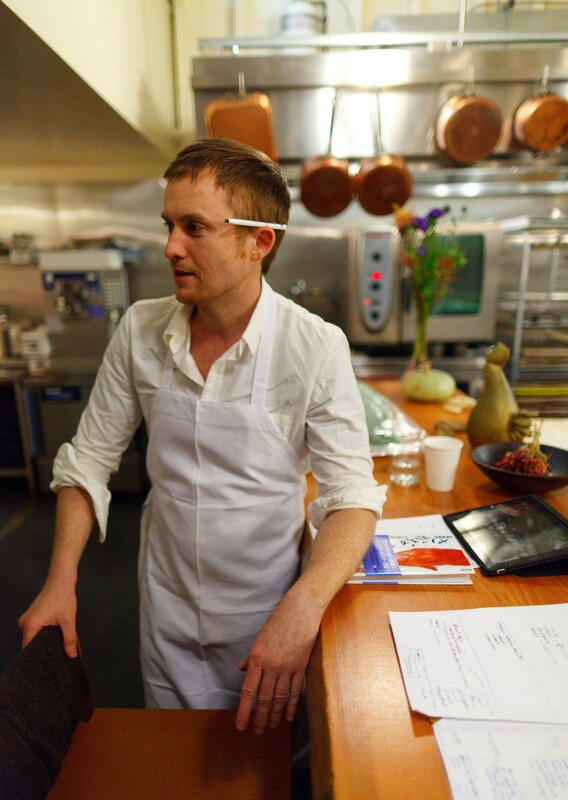 Chef Joshua Skenes is onto something big. Of all the restaurants I visited in the bay area during my recent trip, this is the meal that keeps haunting me. Skenes use of the hearth as a tool for flavor intensification defines his very unique cooking style. Every course had at least one component that was touched by fire. It's this traditional cooking that makes Skene's food rustic, honest, and straight-forward. I can't wait to go back. If Chef Skenes continues on his current track, with time, his cooking can only get better.